The kite’s leash is the primary safety device. It keeps you attached to the kite and the kite attached to you. When you have your kite attached, you can use it as a floatation device and a lifeboat (means of getting back to the beach). It is highly visible allowing you to be seen by would be rescuers. Even if you cannot re-launch it, you can use your kite to do a self rescue and pull you to shore. This will save you from some very long swims. But the kite leash’s main function is to protect the people around you from getting taken out by your lose kite. When you are riding, always remember that your leash is there for everyone else’s safety. A properly functioning leash also activates the kite’s safety system and depowers it. But, be careful: A leash in a suicide configuration is pretty much a liability to everyone including the rider. You would be surprised by how many people do not know how to use their safety systems. There is really no excuse for this. Maybe you are renting a kite, testing a new kite or borrowing a buddy’s kite for the first time. But, any time you are about to use a kite, you must get to know the safety systems. Each system is slightly different. While there are some similarities between most systems, there are some systems that are totally counter-intuitive to use, and could be the opposite of what you are used to. For example, there are chicken loops that release by pushing them away, some release by pulling on them while others release when you twist the collar, and to top it off, there are even some systems where the chicken loops are fixed and do not release at all. In an emergency, you should be able to release from your chicken-loop instantly and without looking. So, if you do not thoroughly know the system you are using, you will have a big problem. This applies to every part of the safety system. Kite leashes too have different quick releases as some pull, some you push and some you have to pull a special release pin. This seems obvious but on any crowded kite launch site, you will see people breaking this rule every day. The reason that you never want to do this is because you are endangering the persons below the kite. The kite can suddenly power up and could hit, cut, slice, drag, drop, or knock down any person within the kite’s wind window. This can happen to anyone. Even the most experienced kiter does not have 100% control of their kite 100% of the time. The wind can suddenly gust, lull, or some other factor like a line breaking can cause a momentary loss of control, and then, the kite can injure someone. Even experienced kite launchers must be extremely careful when getting beneath a kite. Many old kiters have stories about kiting in the old days and many have a sad tale about the board leash. The board leash is for surfing not kiting. There have been hundreds of kiting accidents that the board leash has caused and a few fatalities as well. Serious injury can happen from the board sling-shotting at your head or face and even a helmet cannot prevent many injuries. In addition, the board leash can tangle in the bar and lines causing a whole plethora of other problems. What goes up must come down. Remember that anything you fly over can become your landing place. And, you could always land on your head. Kiting is better when done over water, because this gives you a soft forgiving medium to crash into. Over water you can try stuff and know that you will fall with a splash or a splat. By comparison, just try landing on a pile of rocks, a jetty, or a gnarly sharp tree. These aren’t as forgiving. Kiting is a numbers game. Sooner or later you will crash. Whatever risks you take will eventually catch up with you. Whatever you jump over, you will ultimately land on. It is just a matter of time. There are many examples of skilled kiters making crazy jumps over stuff but there are also a lot of examples of them crashing hard. You should weigh the risks against the reward, and ask yourself if it is really worth all the pain and time off the water to do some macho stunt. IMHO jumping over stuff is kind of dumb. Why not do a really technical trick or a really big jump instead? But, just do it over water, so when you do wipeout, you can get back up and try it again. Plus, if you do get seriously injured and or killed trying to jump stuff, you will probably get your local kite spot shut down in the process as well. This is just as important as the look before you jibe rule. Looking before you jump is vital for kiters because when you jump with a kite, you can travel large distances and stay aloft for a long time. The traffic in your landing area can change between the time you take off and the time you land. You should always look in all directions before you jump including upwind of you because someone else could already be in the air or about to jump behind you. Also, try to look at the traffic patterns and think about where people will be while you are in the air. Maybe, they do not see you take off and ride into the clear area that was your intended landing zone. We generally recommend that you should have at minimum of at least 50 meters clear area downwind and 30 meters clear area upwind of you before you jump. But, many kiters jump further than that so they will need to allow even more room to move. A safety buffer is what you create to keep some distance between you and something dangerous. A safety buffer is both distance and time. When you are moving faster you will need to make your safety buffers bigger. You should create a safety buffer whenever you see something that you do not want to hit. This could be the beach, some rocks, other kiters, or obstacles. When creating your buffer, you should also consider how far your kite reaches out ahead of you keeping in mind that your safety buffer starts at your kite and extends beyond that. A safety buffer between two kites (or two kiters) is ever greater. If you have 25m lines and the other kiter has 25m lines, you need a minimum of 50m between you to ensure that the kites don’t touch each other but that still does not allow for any separation between the kites. The safety buffer is the extra area/distance between the closest possible points of contact. Sometimes kite instructors will recommend a safety buffer of two or three kite line lengths away from an obstacle on full length lines that translates to 50m to 75m. But, in strong winds, the buffer should be increased. Sometimes, the buffer needs to be 5 line lengths and in extreme conditions up to 10 line lengths (10 line lengths = 250m). Whatever safety buffer you leave downwind of you to keep out of danger and stay away from objects, should be the same for the guy riding upwind of you. So, if you like a 75m buffer downwind of you, then the guy riding upwind of you probably wants to stay about that same distance away from you because you are now the obstacle that he is trying to avoid. If I am kiting in extreme winds at my limit, I can assume that anyone upwind of me is possibly kiting at their limit too. So, I do not want to let them get inside my upwind safety buffer. And, I do not want to ride into their safety buffer either. Always try to consider the amount of reaction time and stopping distance you would need to avoid an accident. In strong wind, there is less reaction time. Because things happen faster and you are moving faster, the stopping distances will also need to be increased. One thing is certain in kiteboarding. You cannot control the weather. But, what you can do is recognize bad weather when you see it and try to anticipate bad weather by using forecasts and weather services. Weather services are not just for finding good wind. They are useful for helping you to avoid bad weather as well. Different weather conditions make for bad kiting conditions but storms are the most common and easily avoided weather phenomena. If you get to the beach and it is raining or cloudy; there is a thunderstorm; is extremely windy; or you see a cumulonimbus cloud approaching, then don’t go out. Of course, you should have already known that there was bad weather because every good kiter checks the weather before going to the beach. But, sometimes the weather changes quickly and you will have to keep your eyes on the sky for telltale signs of change. Clouds are good indicators of weather changes and so are rapid drops in temperature or sudden shifts in wind direction. And, if you hear thunder, get out of there fast. 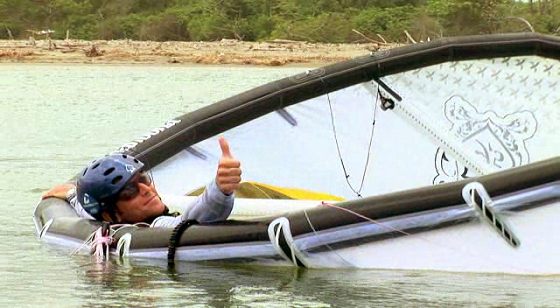 Many serious kiteboarding accidents are attributed to bad weather. But, you cannot blame the weather. It was the fault of the kiter himself who is ultimately responsible for deciding to go out in bad weather conditions. When you are kiting at a new spot, it is always a good idea to ask the locals if there are any special signs of approaching bad weather to watch out for. Once any kiter gets beyond the basics and starts mixing in with the general kiting population, they should also know the most common ROW rules. There are the basic rules for sailing that also apply to kiting: “port gives way to starboard;” “upwind gives way to downwind;” and etc. There are some kite specific rules as well like “the upwind kiter keeps their kite high when passing another.” There are many good websites that explain the rules. Some also explain the rules for kiting in the waves, and also, for kiting with other types of water craft. We have to learn how to share the water with each other and how to share the space with other water users as well. And, most of all know the ROW rules to help you to avoid accidents. Another way to put this is “always know your limits.” By not kiting further away from shore than you can swim, puts into perspective that no matter how good at kiting we are, we are just a swimmer when we lose the kite. Kites can get away from us or breakdown and become useless. Eventually, every kiter will have to swim back to shore. Think about this before riding far away from the beach or traveling long distances. At any moment, you could lose the kite and you will have to swim. Also, think about: the time it takes to swim; what if there are tides or currents; or maybe you will be swimming back after sunset and no one will see you; what if you are hurt and cannot swim; what if it is really cold and you start to get hypothermic? So, the real message is know your limits and think about your vulnerability. You can usually have a great session and stay relatively safe by managing the risks, thinking about problems before they occur and staying close to shore.